Three cruise lines offer cruises to Jamaica from New Orleans, Louisiana. The island is famously laid-back and fun. Most of the cruises are one-week long, but there is also a 9-day option. See the full schedule below. Carnival Cruises dock at Montego Bay on Jamaica. The fun beaches have all the water sports and waterfront bars. Good golf courses and shopping are nearby. The town is a hot spot for reggae music too. Norwegian Cruises dock at Ocho Rios on Jamaica. The shore is lined with hotel resorts. 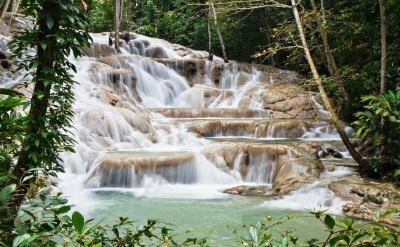 Famous Dunn's River Falls and Mystic Mountain rainforest adventure park are close. The mountainous landscape is covered by lush tropical foliage. The gritty town offers duty-free shopping and plenty of open-air places to eat and drink. Shore excursions on Jamaica include a Jeep safari ride, catamaran sail, Sky Explorer chairlift, zipline, swim with dolphins, kayak a two-mile course down a river, or tour a rum estate. Explore the Good Hope Estate plantation a bird aviary, rum tavern, and an adventure course for kids. Or ride a horse in the surf. 7-day cruises to Jamaica on Carnival Cruise Line. Round-trip from New Orleans to Montego Bay (Jamaica), Grand Cayman (Cayman Islands) and Cozumel (Mexico). 9-day cruises to Jamaica on Norwegian Cruise Line. 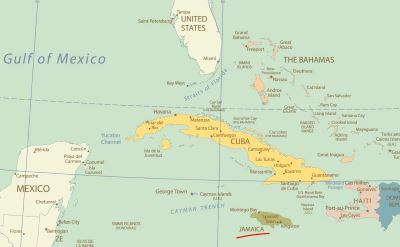 Round-trip from New Orleans to Costa Maya (Mexico), Harvest Caye (Belize), Roatan (Honduras), Grand Cayman (Cayman Islands) and Ocho Rios (Jamaica). • 2020 departures: January 12, January 26, February 23, March 8, March 22, April 5, May 3, May 17, May 31, June 14, July 12, July 26, August 9, August 23, September 20, October 4, October 18, November 1, December 27. 7-night cruise to Jamaica on Disney Cruise Line. Round-trip from New Orleans to Cozumel (Mexico), Grand Cayman (Cayman Islands) and Falmouth (Jamaica).